Blind contour drawing is a really important activity that beginner artists need to engage in, to lead them towards their goal of drawing successfully. Blind contour drawing is the process of drawing the edge of an object without looking at the paper. At first, it's hard to understand what on earth you gain from this but as with everything we learn, the more we practice, the more things fall into place and make sense in our minds. The point of the exercise is to learn how to access and use the right side of your brain which helps you accurately observe and portray your subject. The left side of our brain is too busy, it's the part we use all the time and it relies on stuff we already know - whether it is correct or not! 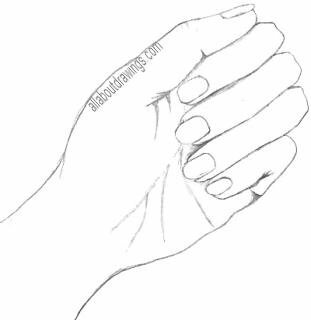 The most common exercise used to practice pure contour drawing is to draw your own hand. Remember, to do the exercise successfully, no peeking (at the paper) is allowed. 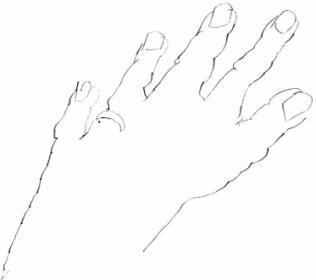 Below you can see the results I achieved by drawing my hand after I had performed the blind contour exercise (which means I glanced from hand to paper), which proved to me that it does work! You can really change your beliefs when you experiment and try things out for yourself. A contour is an edge and edges combine to make a whole image. Before commencing this activity, make sure you are alone and that you are not likely to be disturbed. If you are using a single sheet of paper, secure it by taping it down or use a clipboard. Sit facing the direction away from your paper. I sat side-on to the table and I turned my chair around so that I had back support. I rested my hand on my leg, I was wearing black pants and that provided an excellent background for me to easily identify edges. This is attempt number one and while I was shocked it was nothing like I envisaged, I can still conclude it's a hand. Resist any urge you have to look at your drawing. If you peek, you defeat the purpose of this task. To begin, place your pencil on your paper. 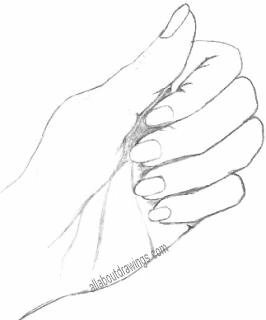 Now, facing away from the paper, pick a spot on your hand from where you'd like to start the drawing. I started at the top of my wrist because I like to draw from left to right. 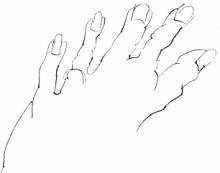 As you concentrate on the contour of your hand, start to draw what you are seeing. This is a simultaneous process - draw as your eyes move slowly over your hand. I found my eyes raced away and went too fast for my pencil so I had to really focus and concentrate on one quarter of an inch at a time. In my blind contour drawing (attempt number 2), you can actually see the little quarter-inch bits as I tried to keep my eyes in tune with my hand movements. In hindsight, I should have drawn in the wrinkles on each finger because they are defined as edges, too. Those lines could have ended up anywhere! Your pencil should move in perfect rhythm with your eyes. As I said, this was the hardest part for me but it may not be the same for you. As you get into this exercise, the right side of your brain should gain complete dominance over the interfering and very busy left side. Once you are finished, think about how you have reacted during the exercise. Did you surrender to the process and feel completely quiet? Could you feel the inner struggle to give in to the need to look at your paper? Your attention is focused entirely on the subject. No attention is given to the drawing. In other words, the left side of your brain is being completely ignored and that's what we want! If you successfully drew your hand without looking, and you took your time, then you just used the right side of your brain - the artistic side. I hope you gain a lot from this activity because I know I certainly did. It's like a power boost to what you truly can achieve even though your mind is telling you otherwise. Once I finished doing this experiment, I immediately drew my hand again while glancing between it and the paper. I must admit, I was really hoping for some magic to happen after all the hype I'd read about it. I guess it's not too bad at this early stage but I clearly need to practice more. Luckily, I'm not averse to practicing, drawing is the most enjoyable thing and I'd be a lost soul without it! If you do a quick blind contour drawing exercise prior to undertaking any kind of artwork, you are prepared and ready to draw well. It's like a warm up exercise for your fingers, only this is also good for your mind! If you enjoy drawing activities, you might also like to have a play with the Observation Exercise. I must give thanks to Betty Edwards for her wonderful book "Drawing On The Right Side Of The Brain." I refer to it all the time and it contains more good information regarding blind contour drawing. It really is a must-have for all would-be artists because it opens your eyes to what you are capable of producing. I have the very first version of this book by Betty Edwards and it really is an excellent guide for all beginner artists. Go ahead and prove it to yourself! I guarantee it'll change your life.